There are now quite a few electronic journals for Classics. Some of them are listed by the Digitalclassicist. Here is another example, which is slightly different in scope. It is devoted to didactics and methodology in the field of Greek and Latin and the contributions demonstrate this in a convincing way (Pegasus). First there is the contribution by Lars Fengler on the recent movie on Troy. This modern reading and reshaping of an old story has, of course, its predecessors and can be added to the now long list of such revisions or re-makings of the Homeric story. Besides providing an useful tool for classrooms, Fengler’s contribution makes two interesting points: the table shows clearly how much of the Trojan story is not told in the Iliad. According to Fengler, we have to wait for 50 min before the film shows a scene referring to the first lines of the Homeric text. This statement leads us the the second contribution of Pegasus we shall discuss. The second interesting point in Fengler’s table, is the emphasis on the settings in his second column. For a project focusing on the topographical elements of the Homeric text and how there were read in Antiquity like the present one, a new list of settings from the Troad or from the Homeric text is very interesting. The choice of the mentioned places made by Petersen raises several questions. First of all, it is interesting to see that for a movie (not a book neither for an oral performance) the settings seem to be the most important elements to create the outline of the story. Second, making a choice always involves leaving out some items. This is true for Antiquity and for modern times. Having now this subjective choice made by a modern movie-maker, we could compare it to the choices ancient authors or commentators made and ask the question why some settings are thought to be more relevant to modern movie-watchers and other more appropriate for ancient audiences. One important difference is, of course, the presence of the Homeric poems in everyday life. This leads us again to the second article from Pegasus. (see Fengler, Pegasus-Onlinezeitschrift 2+3, 2005, 80-87). The second contribution is written by Gerson Schade on the classrooms in Antiquity. He discusses the new insights given by papyrological findings. In our discussion here, his article, as well as many others, emphasizes once again the importance Homer had in ancient education and how much the Trojan story was well-known in Antiquity. This is a major difference one has to bear in mind when creating or commenting on new version of the Tojan war (see Schade, Pegasus-Onlinezeitschrift IV/2 (2004), 55). JSTOR has conducted a study on needs, challenges and missions of University presses in a digital age and has published its report. The study is based on interviews of several institutions involved in university publishing, coming however mainly from the US. The authors of the study believe that University presses could play a more substantial role in the new publishing schemes than in the traditional ones. According to them Universities’ missions, as non-profit organizations, should also involve publishing scholarly results, besides producing them and transmitting them through eduction. They also emphasize that the new means promote sharing of information and results among scholars and create further discussion for specialists, which could again be of great interest for Universities. Another important aspect of these activities is a closer link to librarians and their needs for storage and creating new repositories for the electronic publications. And finally the authors believe that these changes could be a great opportunity for smaller institutions to be more attractive. The study shows also that one should not create a too clear-cut distinction between printed books and new electronic publications. The documented change does not mean the end of the book, which still -and always may have- some advantages over electronic publications. It is therefore not the scholarly monographs, which will be the main target of electronic publications. There are other forms of scholarly writings, which are more suitable for electronic publications and the authors of the article mention for instance electronic journals as a good starting point (maybe relying on their own point of view). They also draw attention to the fact that there is also a wide range of methods to give access to these electronic publications, reaching from suscription-based publications to open access documents, each of these methods having advantages and inconvenients for scholars, readers and publishers. 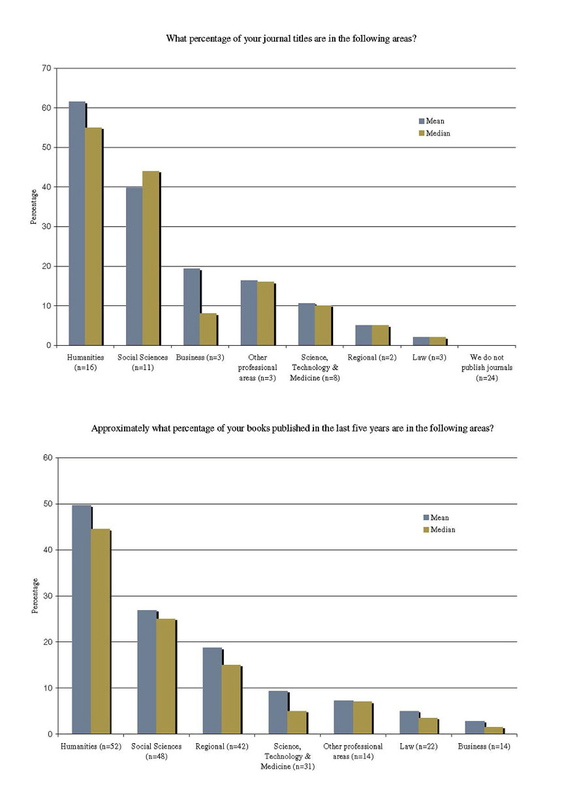 – according to the graphs following the article, the part taken by publications from the fields of Humanities (books or journals) is amazingly high in the institutions selected for the study. Scholarly research based in Humanities could then take an important part in shaping the development of the new medias for their own needs. But often, as their own domains of research do involve less technological aspects, the fields of Humanities are the most reluctant to move to electronic publications. There are no doubts good reasons for this situation. For the Humanities, the book has always be central, as source for information, object of study and goal to achieve. And the question remains of how much value a printed book may always have as objet of study and evidence of scholarly activity in the field of Humanities. There lays then another important challenge for electronic publications. The annual meeting of the TEI was held at the University of Maryland, College Parke last week. It allowed project from all kind of disciplines to be presented and to learn the latest development in the field.